So I’m a few months in to my debt repayment journey, and I’m feeling pretty good about how I’ve done so far, but I’m a numbers and data kind of person–so I want a better way to track my progress. Sure, I said, March was an $8,442 success. But, I want to take some time to play around with some new ways of measuring success. Two of my new year’s resolutions were to track my net worth, and improve my credit score. I’m going to start with those two, then I’m going to take a look at my budget by percentages, the way Jordann suggests. This makes a lot of sense to me. So go with me as I explore these 3 topics here. Basically immediately after I decided I wanted to track my net worth, I realized I didn’t know how. You fine folks were so kind as to tell me what you include, and what you don’t. I loved talking about it, but your responses varied pretty widely, and I was kind of uncertain as to which way to proceed. Some of you include your cars (we have one paid off, one we’re paying on), your homes (we rent), your insurance cash out values, and even earning potential. All of this sounded a bit fuzzy to me. What I really learned is that everyone measures it differently–in a way that makes sense to them. And so I’m going to define my own new net worth calculation now, as: (money in savings, including retirement accounts) – (debt outstanding). That’s it, clearly delineated. By these standards, I’ve increased my net worth by $15,731.56 in 3 short months, so I’m feeling pretty good about it. I think I like it. And just for fun, here’s a little graph depicting the above. Before I got married, my credit score was a solid 780, of which I was proud. A lot of life happened after that and a lot of everything went on credit cards that I could not afford to pay off in full each month. And here we are. 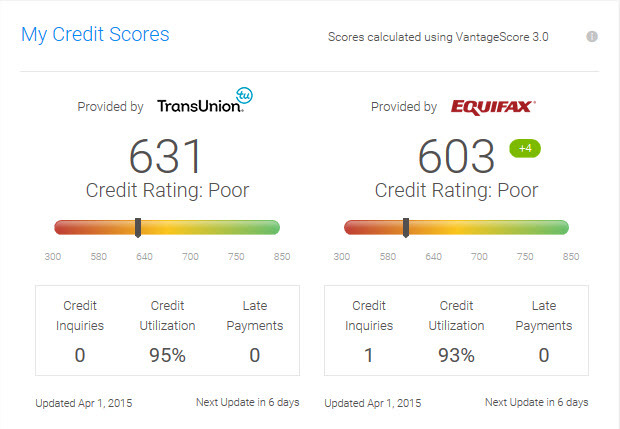 My credit score is much, much worse than it used to be. None of this info is surprising to me. My credit utilization is high (like 95%–I know, it’s gross), my credit history length is medium (8 years), my payment history is excellent (never a missed payment), my portfolio diversification could use some work (only have an auto loan and credit cards). 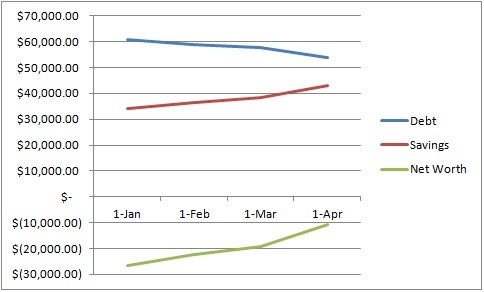 And so, I want to keep good track of my credit score, and watch it rise (just like I saw it plummet years ago). This has been a little harder than expected to put into practice, because I’m getting pretty different scores from 3 different sources. I used to only use the free credit reporting Capital One provides its customers. I was stuck at a steady 678 for months and months. A couple of months ago, I noticed they had a delinquent account reported by TransUnion, so I did some digging. The “delinquent” account was from when I lost a credit card, and requested a new one. It came with a new credit card number, but the old card was somehow reported as delinquent with something like 22 missed payments. Yikes! I filed a dispute with TransUnion, explained the situation, and got a letter back saying it had been corrected. But when I logged into Capital One, my 678 hadn’t budged, and it still showed that delinquent account. So I signed up for CreditKarma, I remembered Shannon suggesting it a while back. They reported me as 631 with TransUnion and 603 with Equifax. Ufff. Those are low. Like, really, embarrassingly low. But you see? That’s motivation, and that’s what I’m here for. The TransUnion report here, does not show that account as “delinquent,” but rather “closed,” which is correct. Same with the Equifax report. So those are more correct than the Capital One reporting, but why are my scores so much lower? Then I remembered I have a Mint account. I don’t really like Mint, but it’s there. I looked at my credit score there and… you guessed it. Also pretty different. 660. No delinquent accounts, from Equifax. So I’m a little mind-boggled as to why these are all different. My two Equifax scores show 603 and 660. They report the same info. My two TransUnion scores are 678 and 631, the former showing the erroneous delinquent account, the latter not showing it. Thoughts on this? I’m going to keep digging. The last thing I want to tackle here today is my money-mix. It’s possible that I MIGHT be moving soon (more on this to come). If I do go, it’ll be because of a pay-raise. But I don’t know where I might be going or what the pay-raise might be. I’ve been struggling with this a lot lately. Click on it to make it bigger! The green is debt repayment, the red is savings. Yes, they are VERY far off from the ideal pie above. The truth of the matter is that I carry so much debt, I’m paying just the minimums on my credit cards, and it’s eating away at half of my money. I’m wonky for a few reasons. We live in on-campus apartments, so our rent is rolled in to my husband’s tuition–and utilities are all included. We don’t pay a monthly rent–but when you see me saving for “tuition” it’s really tuition and rent and utilities all in one lump sum. Hypothetically speaking, if all other factors stayed constant, and I wanted housing to be 25% of my spending, I’d need an $18,000 raise to be at that point. And so now I have a very rough, working number. That’s $1500/mo, which I think is realistic. Of course, realistically, if I move, my cost of living is going to increase by more than just rent–but at least I know that if they offer me less than a $20k bump, I might be making a mistake in taking it. Yep. This exercise has been eye-opening. Definitely good to look at it this way. I’m going to keep tracking my pies. What do you think? What other sorts of progress tracking tools do you use? I want to know! I’m in the mood for experimenting. This entry was posted in Debt Updates by Chela. Bookmark the permalink. Congrats on increasing your net worth by such a large amount, that’s incredible! So, you’re starting from a deep hole, but the progress you’ve made so far is super impressive — I hope making the pretty charts showed you that! I’m also impressed that you’ve figured out how much extra money you’d need to make a move worth it; that’s the kind of thing I often don’t think about when comparing salaries so good on you for figuring it out in advance. You are making fabulous progress on your debt repayment. 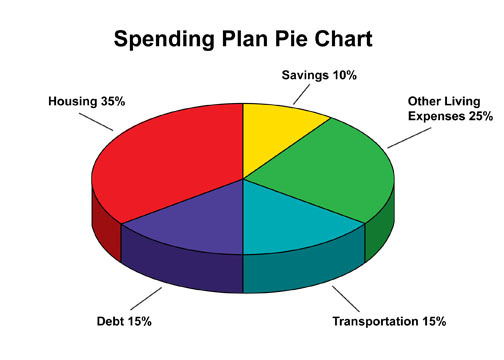 I really like your pie charts – so out of balance with all of your savings and debt-repayment! I’d say keep that up for as long as possible. I’ve become cynical about the whole credit score thing, and your experience just makes me more so. I follow Dave Ramsey, and he has had a very bad credit score for a long time – because he doesn’t borrow money. I don’t think you need to worry too much about your score. You are (quickly) putting yourself in a position where it won’t matter anyway. Thanks, Prudence! My pie charts are good, but not by choice… I’m paying the minimums on everything, and my 401k portfolio seems to be doing well. I wish the debt repayment pie slice weren’t so huge so I could save for things other than retirement, but oh well. Slowly but surely. I’m still figuring out how I feel about the credit score thing. Before we got married, my husband’s was really low, too, for Dave Ramsey’s reason. But I added him to my credit card accounts and his has steadily gone up. I just want to make sure when the time comes to buy a house we’re in a good position to get a palatable rate. I think I need to do more tracking like this as I don’t do any right now at all. I just track my EF savings and how much my debt goes down each month. Love these though! I’m glad you explained why your housing is 0% as I was going to ask that until I saw the explanation.